Al Khalidi Women’s Health & Breast Center is dedicated to improving women’s health and quality of life by providing a continuum of care across the women’s health lifecycle, from prevention, screening and diagnosis to treatment, management and surveillance. This approach enables us to focus our efforts on wellness and prevention, to better understand the clinical pathways of different health conditions and to identify areas for improvement. The most frequently diagnosed cancer in women worldwide, breast cancer presents in many different ways, hence driving the need for a multimodal approach to perform a comprehensive diagnosis. The Breast Cancer and Diagnostic Center offers a range of imaging systems and health care informatics solutions to aid in diagnosis and the development of treatment plans. Digital mammography: Our advanced system includes 3-D imaging to provide a more complete view of breast tissue, thereby aiding in prevention and early detection. If a biopsy is indicated, the procedure can be performed at the time of screening for greater patient comfort and convenience. 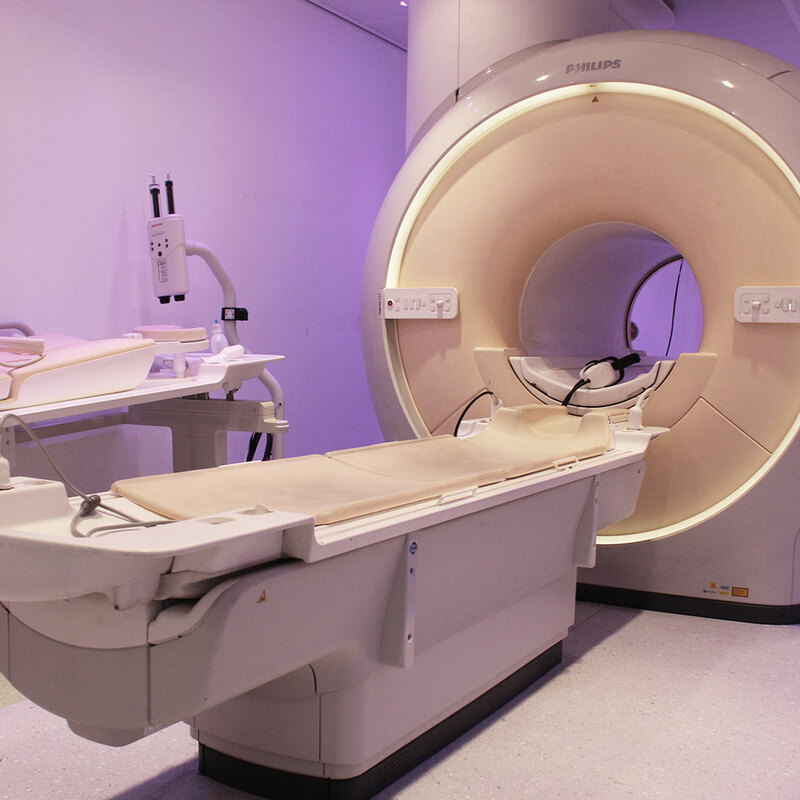 Magnetic resonance imaging (MRI) with breast MRI coil. MRI provides greater soft tissue contrast than x-ray mammography. This makes it particularly useful for follow-up testing after initial screening to confirm a diagnosis. Ultrasound. Women with more dense breast tissue can benefit from ultrasound exams, which have been proven to boost cancer detection. Heart disease is the leading cause of death among women worldwide, claiming more than 3.4 million lives every year. Coronary artery disease in women is often clinically different than in men, and women are more likely to present with atypical symptoms. Al Khalidi Women’s Health & Breast Center offers a complete portfolio of solutions to support the diagnosis of heart disease in women and works closely with leading healthcare organizations to provide solutions that address women’s unique cardiovascular needs and improve early detection. Women’s health and well being can be affected by many gynecological issues, including benign conditions such as abnormal uterine bleeding, pelvic floor disorders and infertility, as well as more serious cervical, uterine and ovarian cancers. More than one million new cases of gynecologic cancers were diagnosed worldwide in 2008. Our novel technologies for imaging can help support earlier diagnosis, at a stage when treatment stands a better chance of success, minimizing the need for invasive procedures.